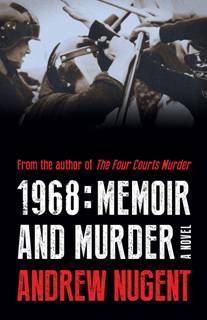 1968: Murder and Memoir captures the essence of rebellion in France in 1968 and the troubled fear of a young man searching for justice. Young, idealistic and eager for life experience, Andrew and his childhood friend, Eoin, leave Strasbourg, where they are both studying, to embark upon a summer hitch-hiking trip through Normandy and Brittany, escaping the political turbulence of the 1968 Student Revolution. Spending their days apart, Eoin and Andrew meet each evening to share their adventures on the road. The purpose of their adventure is the broadening of their world by engaging strangers in conversation, and listening to their stories. It is this opening that brings Eoin to his downfall, as he is disappears one evening, only to be discovered dead, in a shallow grave weeks later, propelling Andrew on a climatic hunt to find his killer. In this fictionalised memoir, the drama of close friendship and young love is played out against a traumatic murder mystery, where seasoned crime writer Andrew Nugent pens a strikingly tender depiction of friendship and self discovery.